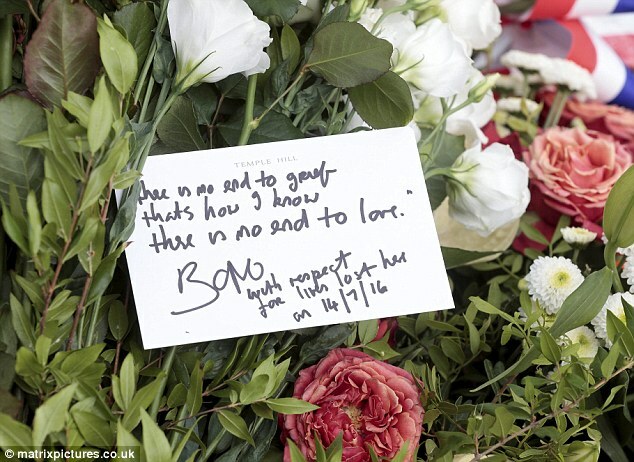 The famous singer-songwriter laid flowers and wrote a poignant message on a piece of card. 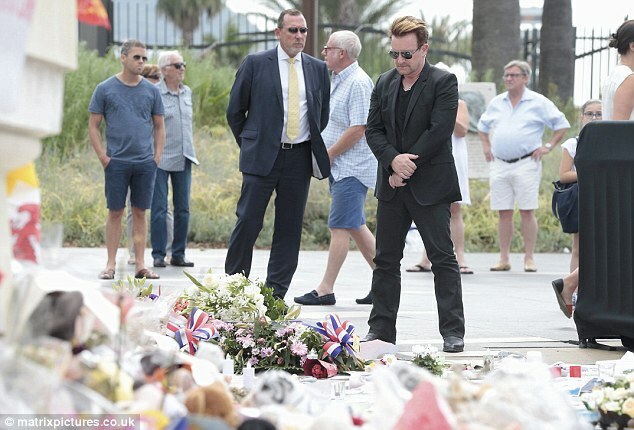 Bono's emotional message is similar to some of his own lyrics and his visit to the promenade comes after the band tweeted their support for the victims and the people of Nice. After Bouhlel drove a hired lorry into crowds enjoying a holiday firework display Bono and other diners were gripped by fear. Ms Rubi told La Parisienne magazine that 'by reflex' she grabbed the arm of Christian Estrosi, the former Nice Mayor, who was sitting close to Bono. She said: 'He was on the phone. He didn't want to say much. I think he was just learning about the attack'. Ms Rubi's staff pulled down the shutters, and instructed everybody to hide and remain calm, until the all clear was given. Bono owns a home in the nearby town of Eze, and had been relaxing with friends when the atrocity started at around 10.30pm last Thursday. 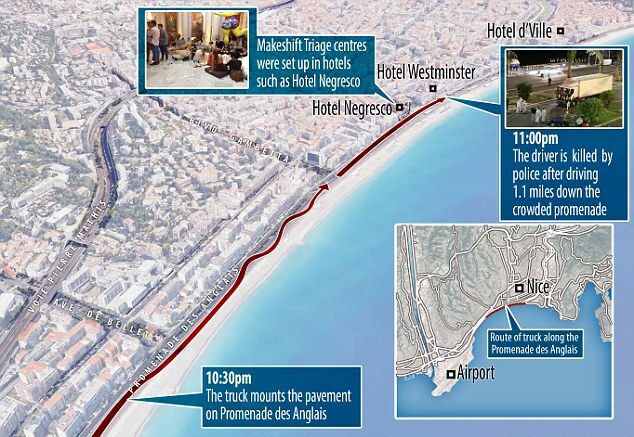 As the slaughter on the Promenade des Anglais became clear, the star was eventually rescued by armed officers who led him to the nearby Massena square. 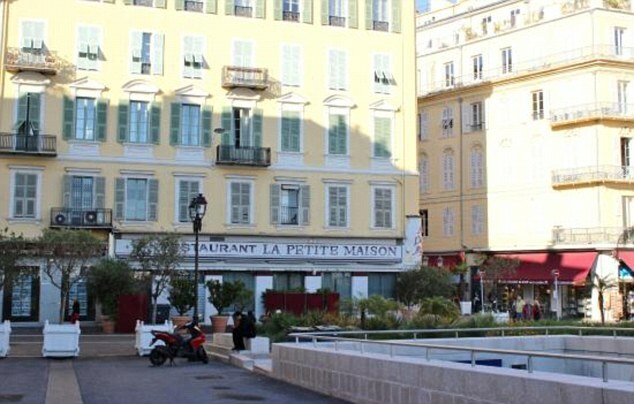 Another diner said: 'It took around half an hour for the police to get us out. Like everybody else, Bono had to put his hands on his head, and was told to remain calm. There were fears at the time that the nearby Meridien Hotel might be under siege, and that bombs were set to explode. Also in the restaurant was Eric Dupont-Moretti, the lawyer of Real Madrid footballer Karim Benzema, and the restaurateur Alain Ducasse. 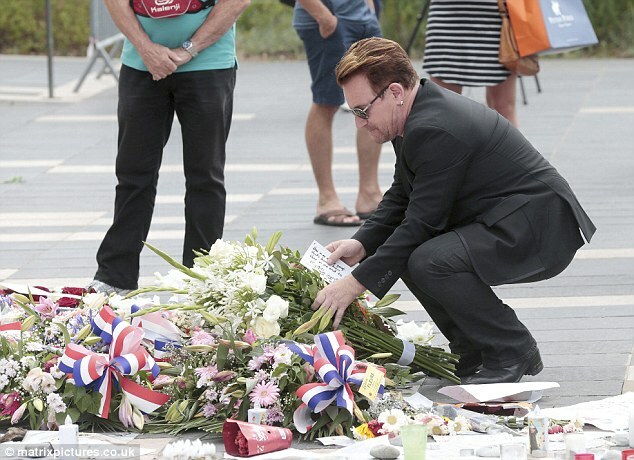 It was the second time that Bono has found himself close to a major terrorist attack in France. Last November he and his band were rehearsing for a concert in Paris, when Islamic State operatives attacked the nearby Bataclan theatre, killing 89 people. Rather than leave the French capital, the four U2 members made their way to the Bataclan the next morning, and paid homage to the deceased. IRA and Irish unionist terrorism is a constant theme in the music of Bono, who as a boy was a first hand witness to the Dublin and Monaghan bombings which killed 33 in 1974.